Houthi rebels in Yemen said on Monday they were halting drone and missile attacks on Saudi Arabia, the United Arab Emirates and their Yemeni allies, responding to a demand from the United Nations. The Iranian-aligned group, which has been battling the Saudi-backed government for nearly four years, also said it was ready for a broader ceasefire if the Saudi-led coalition "wants peace". The Houthis' decision to halt missile attacks could be a turning point in peace efforts as it ends a direct threat to Saudi Arabia. It is by far the biggest concession from the movement since it left the southern port city of Aden in 2015.
International pressure has mounted on Yemen's warring parties to end the war that has killed more than 10,000 people and pushed the country to the verge of starvation. The move from the Houthi group came after the coalition ordered a halt in its offensive against Yemen's main port city Hodeidah, which has become the focus of the war. "We announce our initiative...to halt missile and drone strikes on the countries of aggression," Mohammed Ali al-Houthi, the head of the Houthis' Supreme Revolutionary Committee, said in a statement. The decision was based on discussions with UN special envoy Martin Griffiths to show "good faith" and support peace efforts, he said. The UN special envoy to Yemen welcomed the Houthis' announcement to halt drone and missile strikes on the Saudi coalition, his office said on Monday. Griffiths is trying to salvage peace talks after a round in September collapsed when the Houthis did not show up. He hopes to convene talks before the end of the year in Sweden to agree on a framework for peace under a transitional government. Yemen's parties have given "firm assurances" they are committed to attending peace talks, Griffiths told the UN Security Council on Friday, with Britain asking the council to back a humanitarian truce in Yemen on Monday. Saudi Arabia's King Salman on Monday reiterated the kingdom's support for UN efforts to end the war. The Riyadh-backed government also announced its willingness to take part in the next round of consultations. Yemenis cautiously welcomed the announcement on Monday. "We pray that this will be the real beginning of peace in Yemen, we are all tired of this war," said Mona Ibrahim, a teacher in the capital Sanaa, which has been under Houthi control since September 2014. "We just want to live like other humans," Mohammed al-Ahdal, a resident of Hodeidah said. 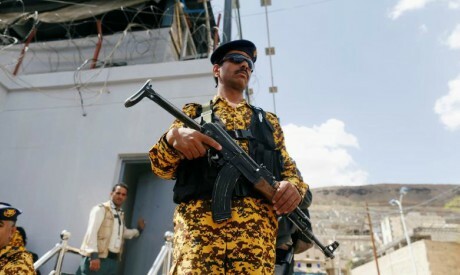 The Houthi defence ministry said it would respond to any hostilities from the coalition. Graham Griffiths, a senior analyst at Control Risks Middle East, said the announcement was potentially important as it comes in response to the coalition's pausing of operations around Hodeidah. "Efforts to resume the peace process remain fragile ... given the mutual distrust between the warring parties. Nevertheless, given the renewed pressure from the international community, there is a real chance to begin to move the conflict toward a durable de-escalation," he said. Houthi-run Al Masirah TV reported on Monday that Houthi forces fired a ballistic missile on Saudi-backed forces in the desert of Midi, bordering Saudi Arabia. The Houthis say their missile attacks on Saudi Arabia are in retaliation for air raids on Yemen by the Western-backed coalition, which entered Yemen's war in 2015 to try to restore the Saudi-backed government of President Abd-Rabbu Mansour Hadi. The coalition has carried out thousands of air strikes in the impoverished country that have hit schools, markets and hospitals, killing hundreds of people - though it says it does not target civilians. Western allies including the United States have called for a ceasefire ahead of the renewed UN efforts. * This story was edited by Ahram Online.